This study was conducted to quantify the forces required to insert the individual panels of a grain rescue tube into four grains of varying moisture contents. The study was conducted to address issues raised by emergency rescue personnel involved with extrication of victims entrapped in grain using a fabricated or commercially available grain containment system. These rescue aids are used to separate or protect the victim from the grain mass, enabling safe rescue. 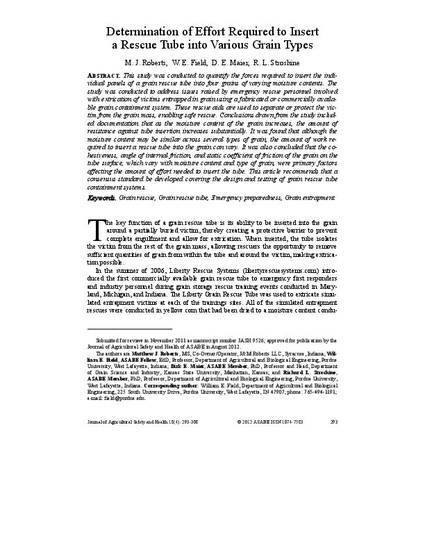 Conclusions drawn from the study included documentation that as the moisture content of the grain increases, the amount of resistance against tube insertion increases substantially. It was found that although the moisture content may be similar across several types of grain, the amount of work required to insert a rescue tube into the grain can vary. It was also concluded that the cohesiveness, angle of internal friction, and static coefficient of friction of the grain on the tube surface, which vary with moisture content and type of grain, were primary factors affecting the amount of effort needed to insert the tube. This article recommends that a consensus standard be developed covering the design and testing of grain rescue tube containment systems. Copyright 2012 American Society of Agricultural and Biological Engineers. Used with permission.